First, I want to make a quick apology that I haven’t been posting much lately. Recently I lost my job (thank you economy!) and am working on some freelance projects to bring in a little income. My goal is to continue posting for chefs of both toddlers and babies. That said, onward! 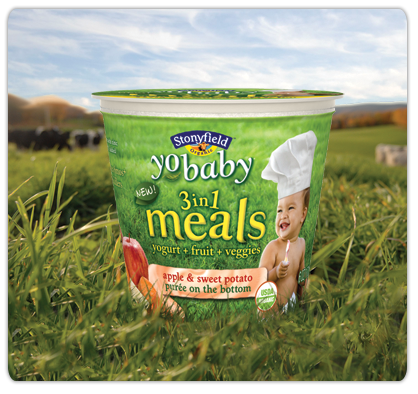 While perusing Walmart a few weeks ago (yes I peruse Walmart occasionally since I don’t typically shop there), I saw they are carrying the new Stonyfield Farm’s YoBaby 3-in-1 Meals. Yes, sneaky chef has arrived to the dairy case. The packaging boasts, “yogurt + fruit + veggies” and is certified organic. It comes in a 6 ounce container, which is the perfect size for my 2 year old. Basically the meals are plain yogurt with the fruit and veggie puree at the bottom. Stir it up and you’ve got a fruity and creamy delicious yogurt meal. As I’ve mentioned before, she has turned into an incredibly picky eater, and refuses to eat anything green, let alone green AND leafy. Currently, the YoBaby Meals are available in Apple and Sweet Potato, Pear and Green Beans, and Peach and Squash. (Any of these combos sound familiar, baby food makers?) Little K likes any of them, but loves the Apple and Sweet Potato. In regards to your question, our current 6oz cup contains 2 tablespoons of fruits & vegetables, which is considered to be one serving for children 0-5 years old. (combined, not each). Considering Little K will eat the entire cup with no hesitation or fight, I’ll take 2 tablespoons for fruits and veggies ANY DAY. Plus it’s pretty nice that YoBaby Meals cost about $1. Let me just throw this out there: Dear Meijer, I usually shop at your stores but you’re not currently carrying YoBaby Meals. I’d love it if you did so I didn’t have to go to Walmart for a single item on my list. If you could fix that, it would be great, thanks! Love ya! In all seriousness, do you shop at Meijer? Tell them you’d like to see YoBaby in their stores by sending them a message. Disclosure: I have not been compensated, received payment, or accepted any product or service for this review. Please see this blog’s disclosure policy in full here. I’m busting it trying to find low cost, personal gifts this year for my family and close friends. I came across this list at The Crafty Crow, and thought it was worth sharing. Since my shelves and refrigerator are filling up with tiny masterpieces, what better way to cut some clutter and gift them? Homemade gifts are so much more personalized that store bought in my opinion. I’ve already matted and framed some of her art, but many of these ideas are new to me. I’ve also purchased a few canvasses from Hobby Lobby during a 50% off sale and let her paint them. I could go on for days about how much she loved painting these. I picked out colors that matched her room and let her paint, using one color at a time. We let each color dry for about a day so the colors didn’t get all muddled. 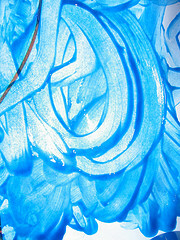 After she was finished I sprayed it with a matte acrylic spray and we hung it in her room. She is super proud! I’ve had several family members ask for her to paint a canvas for them in the colors of certain rooms in their homes. More Christmas gifts done! I love the idea of making a portfolio book, maybe in a few years when she’s amassed a variety of projects, and she can see her progress. Read the full list here from The Crafty Crow. CoffeeShop Photo Blog – Great tutorials and fantastic actions and templates free and easy to install. Me Ra Koh Photography Blog – My personal favorite for inspiration, Me Ra Koh is creator of “Beyond the Green Box” and “Refuse to Say Cheese” DVDs. She’s such a visionary when it comes to empowering women to use their cameras, I strongly encourage you to check her out…quite a breath of fresh air. Digital Photography School – A resource for photographers of all levels, definitely the most technical of the photography blogs on my reader, but also the deepest in terms of resources. I usually don’t include products in the roundup, but I had to share this mint and brown organic onesie from My Baby Rocks. Making your own Vanilla Extract, from Bethany Actually. Obviously you wouldn’t use this in your baby’s food, but nice gift, nonetheless. Ok, another product website, but Sticks and Stones site has really inspired me to look more closely at the environment around me and create one of these photo alphabet projects for Baby K. This family run business specializes in photo gifts, with photos of letters taken in nature and architecture. Check it out, this would be a cool project to start as our babies start to learn their letters. I’ll post mine as it progresses! I’ve collected several newpapers from this year and 2008, mainly election and inauguration news for to show Baby K all of the historical events that took place in the year that she was born and during her first year. How to preserve them? This article from Columbus Dispatch tells how. Whatever you do, don’t laminate! Gardening season is just around the corner. Have you thought about Growing Your Own? As in food and herbs? It’s much easier than you think, visit Seeds of Change to get started. More on organic gardening for baby and your family to follow. The recall on peanut butter products seems to grow every day. Stay up to date using the FDA’s searchable site. One of the coolest things since the convertible crib! I know Christmas has passed, but we could all use a little Christmas spirit every now and then right? Seriously, these bibs are the best. They’re made locally in Seattle by Rain or Shine Kids and feature the WooBee plush fabric that’s both beautiful, soft and water resistant. Rain or Shine Kids also makes WooBee blankets, perfect for outdoors, and WooBee burp cloths in the same fantastic fabric. Wanna WooBee bib of your own? Check out RainorShineKids.com and comment below about your favorite feature of the WooBee bibs. Rain or Shine Kids has a fantastic sale going on right now until January 31st. Great time to try any of their products out, or stock up for baby shower gifts. Comments must be entered by January 31st at 5 pm, EST. When entering our giveaway, please leave a valid email address or make sure your email is available where you can be contacted in the event that you win. Winner must respond within 5 days of email. I can not be held responsible if you do not provide the correct e-mail address or if the e-mail was delivered to your spam folder. US residents only, please. Vanilla Pumpkin is participating in Bloggy Giveaways blog carnival, please visit Bloggy Giveaways for more giveaways. Dear friends, I try hard to exceed your expectations with my posts. If you enjoyed this one, please share it via Delicious, Technorati, StumbleUpon, Twitter or Facebook. Thank you! Disclosure: I did receive a bib to try, but I believe in transparent and honesty in blogging. Receipt of this product did not influence my review. You can read my disclosure policy in full here. Mashed, frozen, sliced, diced to bites, in a medley – you get the point. You can also freeze a banana whole in its peel. The peel will turn brown but the fruit will not. Do you have a favorite banana recipe or tip? Let me know! Together, with the discriminating palate of my 9 month old, Baby K, we put over 25 mass produced, organic, jarred baby foods to the test. All of these were available at our local Target or Meijer, range from stage 1 to stage 3 foods, and include fruits, vegetables, grain blends, meats and dinners. Aside from the few that made the top three, there were several that were tasteless and bland, and then several that were downright cringe-inducing. 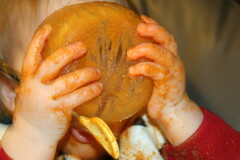 Watch for my post on the Worst 3 Jarred Baby Foods in the next week or so. Hey, we’re on baby time here. Without further ado, here they are, no in particular order, the top 3 mass produced, widely available organic baby foods. We loved Earth’s Best Peach Oatmeal Banana Fruit and Whole Grain, from Earth’s Best “2nd Fruit and Whole Grain Combinations” line. Its home-style fruit and oatmeal blend was a familiar taste, but offered a fruity unique combination of peaches and banana, one that I would not have thought to try (but will soon – I’ll keep you posted!). From Gerber’s Organic 2nd Foods Fruits line, the Apple and Strawberry recipe is just the right blend of apple and strawberry flavors. Neither flavor dominates the taste, and it doesn’t taste overly sweet, unlike some of the other fruit blends we tried. More on Gerber Organic Apple Strawberry. Again, from Gerber’s Organic 2nd Foods, the Butternut Squash and Corn is such a sweet blend of vegetables. Baby K didn’t like corn alone, but paired with the butternut squash in Gerber’s organic baby food, she couldn’t kick her little feet fast enough. (See, that’s one of her ways of showing approval) More on Gerber Organic Butternut Squash and Corn. Look for my Top 3 Baby Food knockoff recipes in the next few weeks as well as the three commercially jarred baby foods that we won’t try again. Until then, Merry Christmas! Does your baby have any favorites? Please comment below!